These beans are so good, you will want to cry because you hadn’t found them sooner. I kid you not! 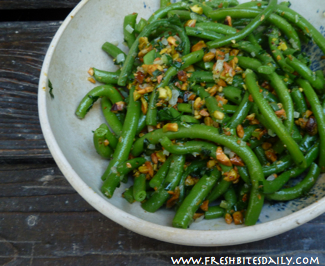 If you love tender crisp fillet-type green beans, you will swoon over these lovelies. 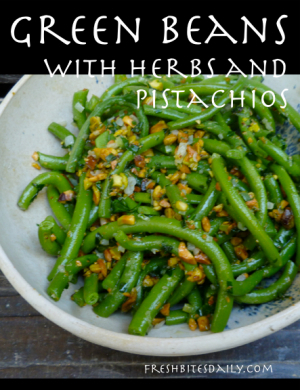 The recipe is adapted just a bit from one by Deborah Madison of Greens fame. Apparently Deborah and a few other stunning chefs collaborated on a cookbook that includes the original version of these beans. If the rest of the food contributors are as skilled as Deborah, the book would be worth a serious look. These folks are all about food sustainability and superior flavors. You probably are too, if you have read this far. Welcome! Deborah recommends Blue Lake green beans. They would work beautifully. By the time I got around to trying this recipe my Blue Lake bush beans were history but the Fortex pole beans were still being good to me. Fortex is a high-performing fillet bean that I highly recommend. Wash the beans and trim both ends. The ends tend to be tough. You will enjoy these beans more without the ends. Bring a large pan of water to a boil. Add a tablespoon of salt and pour in the cleaned and trimmed green beans. Cook the beans until they are tender-crisp. The time can vary depending on the variety and size of your beans. Start checking them at about four minutes. When the beans are done to your liking, remove them from the heat immediately. Drain them and rinse with cold water to stop the cooking process. Pour the drained beans out on a towel to soak up the clinging bits of moisture. Drying the beans a bit is worth the effort. This way the amazing sauce does not get watered down. It is worth the effort! While the beans are cooking, melt the butter in a large skillet. Saute the garlic and onion for about two minutes–enough to soften the onion and infuse the butter with garlic and onion flavor. Add the chopped pistachios, parsley, and thyme to the skillet and toss to throughly blend the flavors. You may need to pull the skillet from the heat to tend to your bean draining and drying. If so, return the skillet to the heat for a moment before adding the beans. When the beans have been dried, add them to the hot skillet. Toss the beans in the butter/herb/pistachio mixture. Completely coat the beans with the butter mixture and check for salt. Make any need salt adjustment and give a good grate of black pepper. Warm the beans to the desired heat, but do not cook them any further. Serve warm or at room temperature. I tried some chilled. The cold locks up a lot of the flavor. You will not want to waste ANY of that amazing flavor!